BRITAIN today delivers a damning verdict on David Cameron’s handling of the terrorist threat. Six in ten people have no confidence in the PM’s response to the crisis and fear he will have little real impact. Most doubt he has the authority within his party – or the coalition – to take the decisive action needed. And more than half say he was wrong to jet off on holiday three days after soldier Lee Rigby was murdered. Serious doubts over Mr Cameron’s reaction to the Woolwich attack are revealed in an exclusive Survation poll published in The Sun today. Alarmingly, even Tory voters are split over whether his action plan will make the country any safer. They want him to take a much tougher line, locking up fanatics who provoke violence and sending terrorist suspects back where they came from. Mr Cameron has vowed to muzzle hate-preachers and stop them spreading their poison in schools, colleges and prisons. He will head a new task force of MI5 chiefs, cops and religious leaders to tackle extremism and radicalisation. But a massive 60 per cent of people don’t believe his plan will have a real impact on the problem. And even more – 63 per cent – do not have full confidence in the PM’s overall handling of the terrorist threat. But 54 per cent DO have confidence in MI5’s ability to protect them from terrorist attack. Survation chief executive Damian Lyons Lowe said: “At a time when the public are looking for leadership, David Cameron appears a little too chillaxed. Mr Cameron’s decision to fly to Ibiza with his family has clearly dented confidence in his, the poll suggests. Some 56 per cent said he should have put off the sunshine jaunt and stayed in London to deal with the crisis personally. Only 36 per cent think he was right to take a family holiday. Tory supporters are deserting Mr Cameron in droves and flocking to UKIP. A quarter of those who voted Conservative in 2010 now plan to vote for Nigel Farage’s anti-EU party. Support for UKIP among the over-54s – those most likely to turn out at an election – is a whopping 25 per cent. Tories now lag nine points behind Labour as the party people are most likely to vote for. The poll puts them on 25 per cent, with Labour at 36, UKIP on 20 and the Lib Dems in fourth place on ten. Seven out of ten people think the UK government should deport foreign criminals while their appeal are ongoing. And 56 per cent say Britain places too much emphasis on protecting freedom of speech and not enough tackling incitement. Nearly four in ten – 38 per cent – believe attempts to kick out hate preacher Abu Qatada will fail and he will stay here indefinitely. Only 24 per cent think he will be forcibly extradited to Jordan by the government. Despite huge condemnation from the Muslims over Drummer Rigby’s murder, most people believe they are not outspoken enough. Six in ten think Islamic communities have been too complacent and need to do more about the threat of hate preachers and extremism. This compares with 26 per cent who believe they have been trying hard and doing all they can to combat the peril. What is your assessment of level of terrorist threat? Very/serious 55, Moderate threat 39, None 6. Confidence in Cameron’s proposals to have a real impact. Yes 25, No 60, Don’t know 14. David Cameron lacks authority in his party to take decisive action. Yes 56, No 34, Don’t know 11. 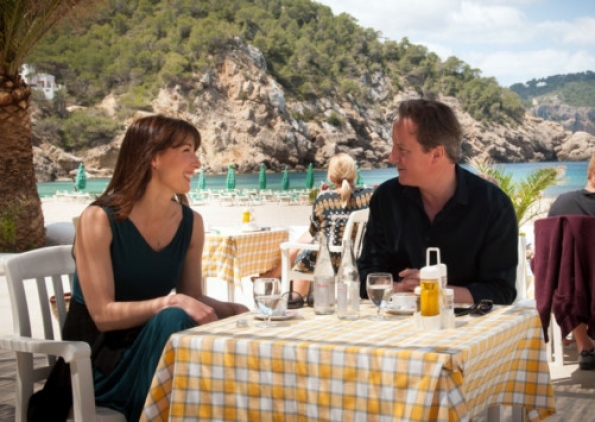 David Cameron’s holiday in Ibiza. Should have postponed 55, Right to go 36, Don’t know 9. Confidence in Cameron’s handling of terror threat. No 63, Yes, 27, Don’t know 10. Muslim communities need to do more about threat of hate preachers 60 per cent. Doing all they can 26, Don’t know 14. He will remain in UK indefinitely 38. Survation conducted its survey by online panel on May 30, 2013. It polled 1,007 adults aged 18+ in England, Scotland and Wales.